Mars moves in mysterious ways. 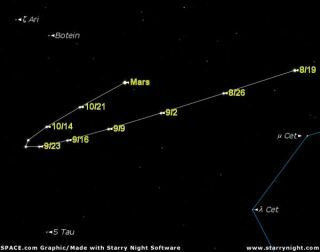 Here's what it will do from Aug. 19 through Oct. 28 (final position labeled “Mars”). The map is as of midnight from mid-northern latitudes. Mars is coming back. The Red Planet, the only one whose surface we can see in any detail from the Earth, has begun the best apparition it will give us until the summer of 2018. Planet watchers have already begun readying their telescopes. If this sounds familiar, you might recall a similar setup two years ago. This current apparition of Mars will not be as spectacular as the one in August 2003 when the planet came closer to Earth than it had in nearly 60,000-years. Mars is currently in the constellation of Aries, the Ram and doesn't rise until around 10:45 p.m. local daylight time. There is certainly no mistaking it once it comes up over the east-southeast horizon. Presently shining at magnitude –0.8, it now ranks fifth among the brightest objects in the night sky, surpassed only by the Moon, Venus, Jupiter and Sirius (the brightest star in the sky). And as it continues to approach Earth, Mars will only be getting brighter in the coming weeks: it will surpass Sirius on Sept. 21 and on Oct. 4 it will rival Jupiter and as a consequence (until Nov. 26), hold forth as the second-brightest planet. Late on the night of Aug. 24, Mars will hover below and to the right of the waning gibbous Moon. As you will see for yourself, the so-called Red Planet actually will appear closer to a yellow-orange tint – the same color of a dry desert under a high sun. This time around, Mars comes closest to the Earth on the night of Oct. 29 (around 11:25 p.m. Eastern daylight time). The planet will then lie 43,137,071 miles (69,422,386 kilometers) from Earth measured center to center. Mars will arrive at opposition to the Sun (rising at sunset, setting at sunrise) nine days later, on Nov. 7. On Oct. 29, Mars' apparent disk diameter will be equal to 20.2 arc seconds. To get an idea of how large this will appear in your telescope, Jupiter currently appears about 32 arc seconds across. So, if you train your telescope on Jupiter during this week, keep in mind that Mars' disk will appear more than one-third smaller than that when it comes closest to Earth near the end of October. Another way to gauge how large this is would be to take a look at the Moon with a telescope and look at the brilliant rayed crater Tycho, probably the most prominent on the Moon's surface. At its best, Mars should appear less than half the apparent size of Tycho (just the crater itself . . . not its rays). While all this may sound small, keep in mind that this is still an atypically large size for Mars. In fact, from Oct. 23 through Nov. 5, Mars' apparent size will be equal to, or slightly exceed 20 arc seconds; larger than it will appear at any time until late June of 2018. From Oct. 29 through Nov. 9, Mars will blaze at magnitude –2.3, more than twice as bright as Sirius, but still inferior to Venus. Mars will still be positioned within the constellation of Aries, the Ram, at a declination of +16 degrees. This is in contrast the August 2003 opposition, when it was situated much farther south at a declination of -16 degrees. Back then, for observers especially in the northern United States and southern Canada, Mars was so low in the sky that atmospheric turbulence hampered telescopic work more than usual. But by the end of October 2005, northern observers will see Mars at a much higher altitude. When it reaches its highest point in the sky at around midnight local time, its altitude will be 59? at Seattle, Washington and 72? at Los Angeles, California. Meanwhile, amateur and professional astronomers in Central America, north-central Africa and southernmost India will have exceptional visibility, for the planet will pass directly, or very nearly overhead! Around the time that Mars is closest, amateurs with telescopes as small as 4-inches and magnifying above 145-power should be able to make out some dusky markings on the small yellow-orange disk, as well as the bright white of the polar cap. But a final bit of caution: even a large telescope will show neophyte observers little when they first look at Mars. To say the least, Mars will likely prove to be a challenging object: the disk is relatively tiny and more often than not it will usually be blurred to a degree by the Earth's atmospheric seeing. However, if you inspect the planet night after night, your eye will gradually become accustomed to the low contrasts and soft boundaries of the disk mottlings. The most prominent area on Mars is a dark wedge known as Syrtis Major. You soon might also grow familiar with the Martian rotation of 24 hours 37 minutes. As a result, a particular feature comes to Mars' central meridian about 40 minutes later than it came the night before. So, it would take a little over a month for a particular feature to come back to the middle of Mars' disk if you were viewing it at precisely the same time every night.